Amber Sand is not a witch. The Sand family Wicca gene somehow leapfrogged over her. But she did get one highly specific magical talent: she can see true love. As a matchmaker, Am-ber's pretty far down the sorcery food chain (even birthday party magicians rank higher), but after five seconds of eye contact, she can envision anyone's soul mate. The Best Kind of Magic is set in urban Chicago and will appeal to readers who long for mag-ic in the real world. With a sharp-witted and sassy heroine, a quirky cast of mystical beings, and a heady dose of adventure, this novel will have you laughing out loud and questioning your belief in happy endings. The Best Kind of Magic is a very cute and light read. 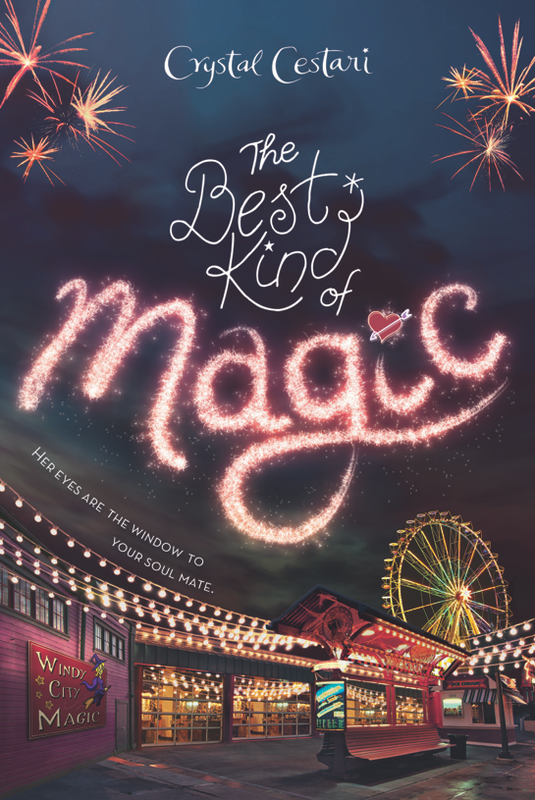 I loved the way magic is incorporated into real life and of course it’s set in Chicago! The store where the story tends to evolve around is called Windy City Magic and located at Navy Pier. I will be honest, this is a kind of store that I have shopped at all my life. There isn’t as many as there used to be so I wish this store really existed. Although I am with Amber and I tend to steer clear of Navy Pier as much as possible. I really liked the setting and I sure part of it is because I’m from the area but also because it was simple but fun. I really liked the underground restaurant for mystical and supernatural people. There was a bakery with cupcakes, I might have to go get some cupcakes of my own today. The setting was fun but I also really liked the magic. It was more of an everyday kind of magic, you don’t need to put on a show to have. Amber’s mom is a witch with a coven. That doesn’t mean she runs around the city casting hexes on people. It means she is more connected with nature and can perform different spells. As well as creating potions, doing readings and that sort of thing. Maybe vampires and fairies are not real (I like to say maybe ha ha) but shops like Amber’s moms do exist. I liked Amber. Her mom is a witch but Amber herself is a matchmaker. She can see who you are destined to be with but she can’t see the same for herself. She comes from this strong bloodline of witches but has none of their powers except for this. She is happy with who she is but she also has that little be of self-confidence issue that anyone would have in that situations. This also makes it different for her to date being that she can see who her boyfriend is going to be with and it’s not her. So that takes the fun and mystery out of it. Amani, Amber’s best friend, is a precog. Her family does not have a magical lineage so she deals more with the side of things where her parents want her to suppress it. .I love her strong friendship with Amber and the fact that they get each other. Even if Amani is not using her talents. Then there is Charlie. He’s the mayor's son and just discovering this world of mystical and supernatural. He was so cute in the way that he pursues Amber, both for her help and for her attention. They end up of having the cutest and complicated coupling. The plot is fun and very light. They are working a missing person's case and I think find out things about themselves along the way. I liked having a more easy going book to read. I also like that there are a few issues besides the main one. Things with Amber’s mom and of course with her relationship with Charlie. So if you are looking for a light and fun romance. I would say this is a good summer read. With rainbows in my hair and stories in my head, I am a writer drawn to magic in the every-day world. My debut novel, The Best Kind of Magic, arrives May 16, 2017 from Hyperion. Follow Am-ber Sand, a magical matchmaker who can actually see true love, as she takes off on a fun and romantic adventure toward happily ever after. I really likes your review.I concur with you that the less conspicuous sort of enchantment is something that truly offers to perusers as does her matchmaking blessing, which is so novel.I love to read lot of books because I am a writer. Seems like a pretty interesting story plot. I am a huge fan of fantasy and romance novels so looking at the plot just makes me very interested in reading the book. I wrote a novel once but unfortunately I wasn't able to finish it. The story revolves around this peasant guy having a crush on a wealthy girl. My story seems weird right? But I think that's what makes a story good. Not clinging on to the cliche provides distinction and it's also a way to make you more creative.